I am writing this on my iPad, using the WordPress app so I can work on a post offline and then update it when I get latched on to a network. I’m still getting used to the onscreen keyboard, which is decent enough apart from having to search for punctuation and the autocorrect – which I may turn off as it is less useful on a tablet device than a phone, especially when much of my technical vocabulary isn’t in the dictionary. As someone who has carried a laptop around for most of the last fifteen years simply having a computing device with me is far from a major step forward but the format of the ipad might encourage me to write more often and to work on stuff when I only have a couple of minutes free, a time period to small to justify pulling out even a fast-starting MacBook. We will see. I’m planning to spend a few days without my laptop to force me to engage with the pad. I’ve acquired a MiFi after John Naughton showed me how useful they are – and am using it to post this. And I will report on my experiences. Should be fun. One of the best things about working on Digital Planet is that I get the opportunity to visit places that I wouldn’t normally get to, and when I’m there I get to meet a lot of interesting people and talk about their work and their lives. Yesterday I arrived in Nairobi, Kenya, to meet up with Gareth and Michelle, and after a trip to the BBC bureau we spent some time at KBC, the main Kenyan broadcaster. But the afternoon was spent at Kibera, the slum in southern Nairobi. It’s the largest slum in Africa, with a population of over one million, and being there was astonishing. I don’t have time now to write about it, or what I thought as we wandered through the space where a million people carve out a life. But I will. The 53rd Venice Art Biennale has just opened, a massive exhibition of contemporary art from around the world that takes over large parts of the city every two years from June to November and turns it into a showcase for the new, the experimental, the exciting and the just plain weird. And I do mean weird. 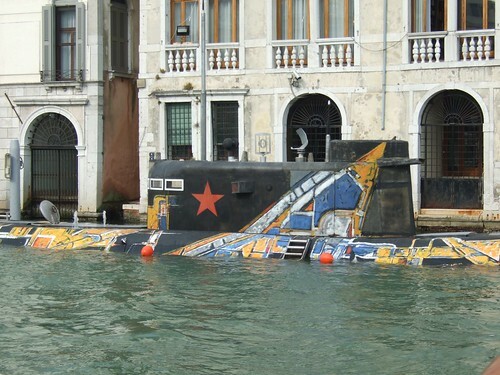 There’s a semi-submerged Russian submarine in the Grand Canal, an Icelandic artist is going to spend the next six months painting a series of bad portraits of a cigarette-smoking model, and a group of Nordic artists are exhibiting a very life-like corpse floating face-down in a swimming pool while a group of naked men sit on deckchairs nearby. Seventy-seven countries are taking part, many of them exhibiting their work in purpose built pavilions in the public gardens of the Giardini while others can be found in the former shipyard of the Arsenale or scattered across palaces and warehouses throughout the city. As well as the national pavilions there are forty-four associated exhibitions and events, and nearly one hundred individual artists have been invited to show work in the central ‘Making Worlds’ exhibition.